Simulation is not magic, but it can certainly produce the feeling. Although it can’t miraculously replace particle physics experiments, revealing new physics phenomena at the touch of a key, it can help scientists to design detectors for best physics at the minimum cost in time and money. 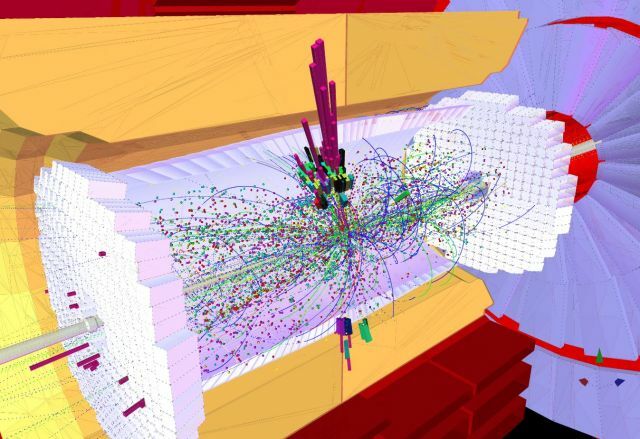 Geant4 is a detector simulation software toolkit originally created at CERN and currently developed by about 100 physicists and computer scientists from all around the world to model the passage of particles through matter and electromagnetic fields. For example, physicists use simulation to optimize detectors and software algorithms with the goal to measure, with utmost efficiency, marks that previously unobserved particles predicted by new theories would leave in their experimental devices. Particle physics detectors are typically large and complex. Think of them as a set of hundreds of different shapes and materials. Particles coming from accelerator beams or high-energy collisions traverse the detectors, lose energy and transform themselves into showers of more particles as they interact with the detector material. The marks they leave behind are read by detector electronics and reconstructed by software into the original incident particles with their associated energies and trajectories. We wouldn’t even dream of starting detector construction, much less asking for the funding to do it, without simulating the detector geometry and magnetic fields, as well as the physics of the interactions of particles with detector material, in exquisite detail. One of the goals of simulation is to demonstrate that the proposed detector would do the job. Geant4 includes tools to represent the detector geometry by assembling elements of different shapes, sizes and material, as well as the mathematical expressions to propagate particles and calculate the details of the electromagnetic and nuclear interactions of particles with matter. Geant4 is the current incarnation of Geant (Geometry and Tracking, or “giant” in French). It has become extremely popular for physics, medical and space science applications and is the tool of choice for high-energy physics, including CERN’s LHC experiments and Fermilab’s neutrino and muon programs. The Fermilab Scientific Computing Simulation Department (SCS) has grown a team of Geant4 experts that participate actively in its core development and maintenance, offering detector simulation support to experiments and projects within Fermilab’s scientific program. The focus of our team is on improving physics and testing tools, as well as time and memory performance. The SCS team also spearheads an exciting R&D program to re-engineer the toolkit to run on modern computer architectures. New-generation machines containing chips called coprocessors, or graphics processing units such as those used in game consoles or smart phones, may be used to speed execution times significantly. Software engineers do this by exploiting the benefits of the novel circuit design of the chips, as well as by using parallel programming. For example, a program execution mode called “multi-threading” would allow us to simulate particles from showers of different physics collisions simultaneously by submitting these threads to the hundreds or thousands of processor cores contained within these novel computer systems. As the high-energy community builds, commissions and runs the experiments of the first half of the 21st century, a world of exciting and promising possibilities is opening in the field of simulation and detector modeling. Our Fermilab SCS team is at the forefront of this effort. In 2012, when scientists at CERN’s Large Hadron Collider discovered the Higgs boson, the machine was colliding particles at an energy of 8 teraelectronvolts, or 8 TeV. Just imagine what a 100-TeV collider could uncover. That’s what more than 80 scientists in the field of particle physics discussed at a workshop hosted by the LHC Physics Center at Fermilab from Aug. 25-28. Such a collider could unlock profound mysteries of the modern era of physics that remain unanswered. The world’s leading experts in accelerators,detectors and particle physics theory gathered to outline how the community could take the “Next Steps in the Energy Frontier” to address these questions. The global community has put forward two possible initiatives for a 100-TeV hadron collider: one based in Beijing, called the Super Proton Proton Collider, and one based at CERN in Geneva, the Future Circular Collider. If built, such a collider would be the largest ever, capable of probing nature at the shortest possible distance ever explored, 10-18 centimeters. It would also be the first particle accelerator to have decisive coverage of exploring a weakly interacting massive particle [WIMP] dark matter candidate. It would also shed light on the mass scale related to the widely discussed naturalness aspects of nature, the asymmetry between matter and antimatter observed in our universe, rare phenomena associated with Higgs boson productions, and symmetry between matter and forces, among other unresolved matters. The workshop provided a platform where leaders from Beijing and CERN discussed in detail for the first time in the United States the issues attendant in realizing the technology required by such a high-energy collider: strong high-field superconducting magnets, including those that can operate at higher temperatures; precise, fast, high-resolution, radiation-hard silicon detectors only 10 to 30 microns thick; imaging energy-measuring calorimeters; next-generation computing frameworks for trigger systems and analyses and other advancements. “It was a very special experience to be on the ‘ground floor’ of such a grand, ambitious and worthwhile collective endeavor. The array of theorists and experimentalists at the workshop included the world’s best,” said Raman Sundrum from the University of Maryland. As with any innovation, these technological advancements will have an impact beyond fundamental research, benefiting industrial fields in R&D and cost. Indeed, a project of this magnitude will require synergies between various initiatives and provide international collaboration opportunities not only within the scientific communities, but also with industry. Members of the particle physics community plan to continue efforts toward a 100-TeV hadron collider, with the United States playing a central role. “This workshop opens a vision for the future of the study of fundamental interactions that points beyond the coming decade, continuing to follow our passion for science,” said workshop co-organizer Meenakshi Narain of Brown University. Ask someone what our world would look like if there were no cars or no telephones and they’ll probably have an immediate answer. It’s easy to imagine how our lives would be different without these things. But what if there were no particle detectors? Most people aren’t sure what would change if these devices disappeared—even though particle detectors are at work all around us. Particle detectors play a role in undertakings from drug development to medical imaging, from protecting astronauts to dating ancient artifacts, from testing materials to understanding the universe. A particle detector is a device built to observe and identify particles. Some measure photons, particles of light such as the visible light from stars or the invisible X-rays we use to examine broken bones. Other particle detectors identify protons, neutrons and electrons—the particles that make up atoms—or even entire atoms. Some detectors are designed to detect antimatter. By sensing the electric charge and interactions of particles, the detectors can determine their presence, their energy and their motion. Without particle detectors, climate models and weather forecasts would be a bit cloudy. One of the most common tools used in modern weather forecasting is radar—radio waves sent through the air, bounced off of objects (such as rain drops) and collected by radio—frequency (RF) detectors. Using radar, scientists can gather information about the location, size and distribution of raindrops or other precipitation, as well as wind speed and direction and other variables. Some more advanced instruments apply the same technique using microwaves or lasers instead of radio waves. Radar is also a primary tool in the study of tornadoes and other severe storms, often with the goal of improving safety measures for people on the ground. The Earth’s climate—the long-term behavior of the atmosphere—is largely created by the interplay between two fluids: water and air. Fluids can be studied in detail in the laboratory using experimental devices that carefully track their complex motions using X-rays and other techniques that rely on particle detectors. Work done in the lab feeds into a growing understanding of our planet’s complex climate. At CERN European research center, the Cosmics Leaving Outdoor Droplets experiment, or CLOUD, is investigating the link between energetic particles from space, known as cosmic rays, and the formation of clouds in our atmosphere. The experiment suggests that the rays create aerosols, which act as seeds for new clouds. CLOUD scientists try to recreate atmospheric conditions inside a sealed chamber, and use detectors to carefully monitor changes taking place. CLOUD’s findings should help scientists better understand the effects of clouds and aerosols on Earth’s climate. Particle detectors continue to change the way medical personnel see the human body—or more specifically, how they see into it. Many types of medical scanners, including PET (positron emission tomography) and MRI (magnetic resonance imaging) rely on particle detectors. Patients undergoing a PET scan receive an injection of molecules designed to accumulate in the hardest-working parts of the body, including the heart, the brain and organs such as the liver—as well as in trouble spots, such as tumors. Shortly after they arrive, a chemical element bound to each molecule will decay and emit a lightweight particle called a positron, which collides with a nearby electron and creates a gamma ray. Throughout this long chain of events, the gamma ray carries information about the body part being studied. It exits the body, is picked up by a particle detector, and the information is translated into images. MRI machines surround the body with strong magnetic fields. Manipulating those fields can cause hydrogen atoms inside the body to emit faint radio signals. Different body tissues emit slightly different signals, and a highly specialized RF detector measures those subtleties, revealing tissue structure. Even X-ray film is a simple type of particle detector: It turns black where it is exposed to X-rays and remains translucent where the X-rays are blocked by bones and teeth. More advanced X-ray detectors used today can image tissue as well. In addition, various types of particle detectors are used in radiation therapy for cancer, which bombards cancer cells with high-energy photons, protons or whole atoms. These particles are forms of ionizing radiation, meaning they can damage the molecules in cancer cells, including the cells’ DNA, making it more difficult for the cells to divide and, ideally, halting the growth of the tumor. Particle detectors help scientists shine a light on viruses and develop drugs to fight them. Intense, focused beams of light created by machines known as synchrotrons provide a window to the microscopic world. Shining such light on certain viruses—like those that cause strains of influenza, or the human immunodeficiency virus—reveals their unique, detailed structure. Particle detectors capture information about the interaction between the photons and the viruses and feed it back to the scientists. Armed with this information, researchers have engineered drugs that specifically target those viruses. Head to your local museum, and you may see evidence of particle detectors at work. Synchrotrons and other material analysis instruments can reveal the chemical make-up of art, artifacts and fossils. For anthropologists, this information can help determine the age and origin of objects. Art historians use X-ray, infrared, UV and visible light, and even beams of electrons, to gather detailed information about great works. This information is particularly important when deciding how best to restore and preserve paintings, sculptures and more. And in some cases, as with a painting by Vincent van Gogh, studies with particle detectors have revealed hidden treasures below the surface: earlier works of art painted over by the artist. Take a trip to the airport and you’ll be asked to place your bag on an X-ray scanner before you step through a metal detector or millimeter scanner—all of which use particle detectors. Cargo containers shipped by air or by sea undergo similar scanning processes. Hundreds to thousands of containers may pass through a major airport or seaport every day and must be scanned quickly and efficiently to ensure dangerous materials aren’t inside. Cargo scanners primarily use X-rays, but in recent years developments have been made using neutrons. Within this busy industry, scientists and engineers are being challenged to build better scanners and improved particle detectors. In the hostile environment of space, astronauts require protection from solar radiation. High-energy photons and other particles ejected by the sun threaten to seriously harm humans who venture above the clouds. Down on the ground, earthlings are protected from most of these particles by the atmosphere. In space, particle detectors play a vital role in keeping astronauts safe from radiation. NASA scientists use particle detectors to carefully monitor each astronaut’s exposure to radiation. Satellite detectors look out for intense bursts of radiation from the sun, and provide a warning to astronauts when excess amounts are headed their way. Particle detectors help test the structural integrity of industrial equipment, such as steam turbines and airplane engines. Smart phones and other computing devices contain semiconductors that are engineered using particle detectors in a process called ion implantation. In geology, neutrons and neutron detectors are used to identify oil reserves and rare minerals deep underground. Electron beams sterilize food, food packaging and medical equipment for consumer safety—and they use particle detectors. Muons—particles raining down from outer space—have been used to probe geophysical phenomena, like the internal structure of volcanoes and mountains. More recently, scientists have been working on devices that use muons to search for radioactive materials in waste containers or cargo ships. And of course, physicists use particle detectors to learn more about the universe, from finding subatomic particles such as the Higgs boson, to searching for new particles that would explain dark matter and other unsolved phenomena, to looking back in time at the first few seconds after the big bang. Particle detectors are used every day, making us safer, healthier and more knowledgeable and helping us get things done. The manner in which particle physicists investigate collisions in particle accelerators is a puzzling process. Using vaguely-defined “detectors,” scientists are able to somehow reconstruct the collisions and convert that information into physics measurements. In this video, Fermilab’s Dr. Don Lincoln sheds light on this mysterious technique. In a surprising analogy, he draws a parallel between experimental particle physics and bomb squad investigators and uses an explosive example to illustrate his points. Be sure to watch this video… it’s totally the bomb. In late 1940s, scientists doing fundamental physics research at the General Electric Research Laboratory in Schenectady, New York, noticed a bright arc of light coming from their particle accelerator. As a beam of electrons whipped around the accelerator’s circular track, photons trickled away like water from a punctured hose. At the time, this was considered a problem; the leaking photons were sapping energy from the electron beam. But scientists at labs around the world were already looking into the phenomenon, and not long after, circular particle accelerators were being built explicitly to capture the escaping light. Today, these instruments are called synchrotrons, and they serve as powerful tools for studying the atomic and molecular structure of a seemingly limitless number of materials. Despite their symbiotic beginning, synchrotron science and particle physics existed largely independent of one another. However, recent developments in the design and construction of particle detectors for synchrotron experiments—as well as new light source instruments—have sparked a reunion. Modern synchrotrons generate powerful beams of light—infrared, ultraviolet, or X-ray—and aim them at a sample—such as a protein being tested for use in a drug. The light interacts with the sample, bouncing off of it, passing through it or being absorbed into it. (Imagine a beam of sunlight diffracting in a crystal or reflecting off the face of a watch.) By detecting how the sample changes the light, scientists can gather all kinds of information about its structure, make-up and behavior. A synchrotron facility can host dozens of experiments at a time. 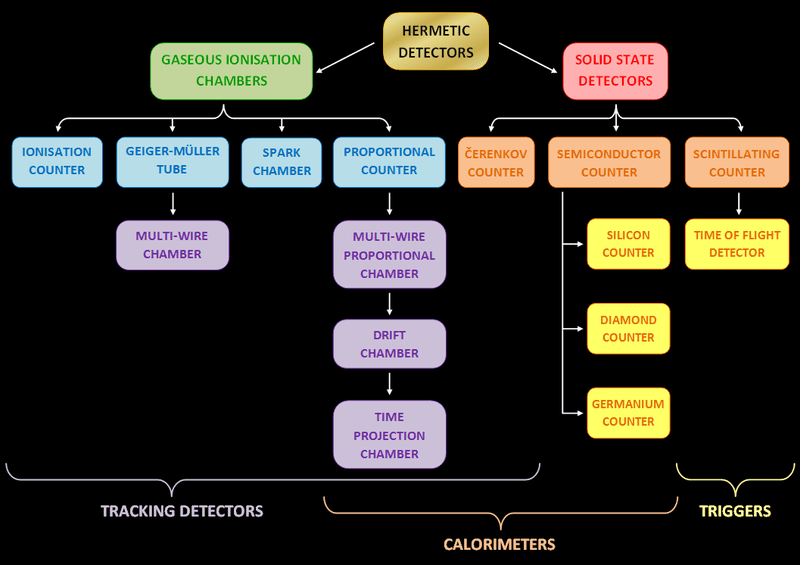 The detector plays a vital role in each one: It captures the light, which becomes the data, which holds the answers to the experimenter’s questions. And yet from the 1950s through the 1990s, the vast majority of detectors used at synchrotrons were not built specifically for these experiments. The designers and engineers would usually buy off-the-shelf X-ray detectors intended for other purposes, or adapt used detectors the best they could to fit the needs of the users. Heinz Graafsma, head of the detector group at DESY, the German Electron Synchrotron, says the science coming out of synchrotrons during this time of patchwork detectors was fantastic, thanks largely to the dramatic improvements to the quality of the light beam. But that same rapid advancement made developing detectors “like shooting at a moving target,” Graafsma says. Customized detectors could take as long as a decade to design and build, and in that time the brightness of the light beam could go up by two or three orders of magnitude, rendering the detector obsolete. The lack of custom detectors may also simply have come down to tight budgets, says Sol Grunner, former director of the Cornell High Energy Synchrotron Source or CHESS. Frustrated with the limits of detector technology, Gunner became one of the early pioneers to build custom detectors for synchrotrons, allowing scientists to conduct experiments that could not be done otherwise. His work in the 1990s helped set the stage for a cultural shift in synchrotron detectors. In the last 15 years, things have changed, especially with the advent of the free-electron laser—a kind of synchrotron on steroids. 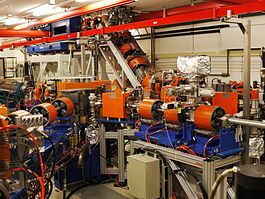 The free-electron laser FELIX at the FOM Institute for Plasma Physics Rijnhuizen (nl), Nieuwegein, The Netherlands. Photon scientists have begun to face some of the same challenges as particle physicists: Scientists at light sources increasingly must collect huge amounts of data at a dizzying rate. So they have begun to look to particle physicists for technological insight. The partnerships that have developed have turned out to be beneficial for both sides. The Linac Coherent Light Source, an X-ray free-electron laser at SLAC National Accelerator Laboratory, has six beamlines open for users. The LCLS has produced 6 petabytes of data in its first five years of operation and currently averages 1.5 petabytes per year. That much stored data is comparable to the major experiments at the Large Hadron Collider at CERN. At the National Synchrotron Light Source at Brookhaven National Laboratory, a group led by Pete Siddons is developing a detector that will use something called a Vertically Integrated Photon Imaging Chip, designed by high-energy physicists at Fermilab. VIPIC is an example of a circuit built with a specific purpose in mind, rather than a generic circuit that can have many applications. High-energy physics helped pioneer the creation of application-specific integrated circuits, called ASICs. 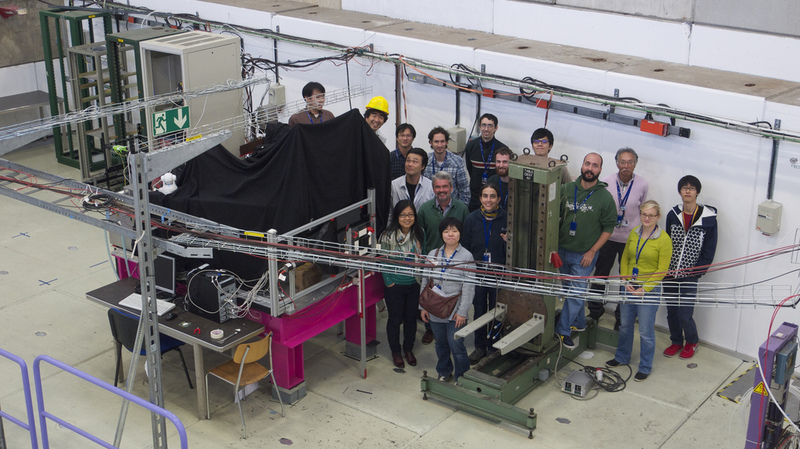 With the advanced capability of the VIPIC chip, the researchers hope the new detector will allow synchrotron users to watch fast processes as they take place. This could include watching materials undergo phase transitions, such as the change between liquid and solid. Siddons and his NSLS detector team are building the silicon detectors that will capture the light, but they need particle physicists to fabricate the highly specialized integrated circuits for sorting all the incoming information. “Making integrated circuits is a very, very specialized, tricky business,” Siddons says. Physicists and engineers at Fermilab design the circuits, which are then fabricated at commercial foundries. Fermilab scientists then put the circuits and particle sensors together into large integrated systems. The collaborative project will also involve contributions by scientists at Argonne National Laboratory and AGH University of Science and Technology in Krakow, Poland. Compared to those used in synchrotron science, particle physics detectors live very long lives. “We may build a few large scale detectors a decade,” says Ron Lipton, a Fermilab scientist who has been involved with the development of several large scale particle physics detectors and is a collaborator on the VIPIC chip. 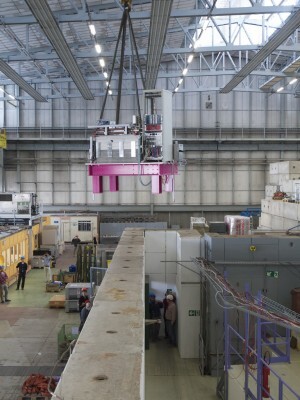 Partnering with synchrotron science has given particle physicists a chance to develop and test new technologies on a shorter time scale, he says. Scientists at the Paul Scherrer Institute in Switzerland used chip technology from particle physics experiments at CERN to create one of the most widely used custom synchrotron detectors: the Pilatus detector. Researchers at Fermilab and DESY say the work put into technologies like this have already fed new information and new ideas back into particle physics. Collaboration also provides work for detector engineers and increases the market need for detector components, which drives down costs, Lipton says. These days, more synchrotron facilities employ scientists and engineers to design custom detectors for lab use or for future commercialization. Half a dozen detectors, designed especially for light sources, are already available.